JONATHAN WILLIAMS -- created two of Belper's best chances in the goalless draw against Northwich Victoria. Both sides hit the bar, but neither could score as Belper Town were held to a goalless draw by mid-table visitors Northwich Victoria at the Marstons Stadium on Tuesday night. The result extended the Nailers’ unbeaten run to five games in Division One South of the Evo-Stik Northern Premier League, but also meant that they have won only two of their nine home matches so far this term. Confidence was high in the Belper camp after their electrifying 3-1 win over high-flying Witton Albion, and a further triumph could have propelled them to as high as sixth in the table. However, the first half was deadlocked, with chances at a premium for both teams. The Nailers did have a number of early efforts from distance, but none of them were close to troubling Mason Springthorpe in the Northwich goal. 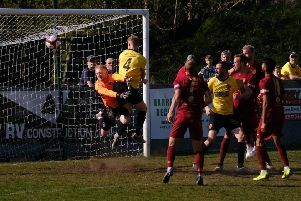 Instead it was the visitors who went closest to scoring in the first half when Michael Brewster’s curling free-kick was spectacularly tipped on to the bar by the outstretched hand of Belper shot-stopper Danny Haystead. The hosts threatened minutes from the break when Phil Watt just failed to connect with a cross into the box by Jonathan Williams. But the biggest talking point of the half ended up being an injury to striker Ruben Wiggins-Thomas, who hobbled off to be replaced by Jermaine Palmer. The second period opened with a huge let-off for Belper when their defence seemed to fall asleep and allow the dangerous Brewster to almost walk through them for a one-on-one with Haystead. Thankfully, his finish was extremely poor. Charlie Palmer’s team recovered well and went so close to grabbing the winner. First, Evan Garnett made an excellent run into the box before squaring the ball across to Alex Steadman, whose effort was miraculously saved by the Northwich ‘keeper, Springthorpe, and put out for a corner. The resultant flagkick was whipped in well by Williams and met perfectly in the area by the onrushing John Guy, whose thunderous header crashed against the underside of the crossbar before being cleared away.